Jared Strait ’07 and Professor Tiku Majumder adjust a custom wavemeter. 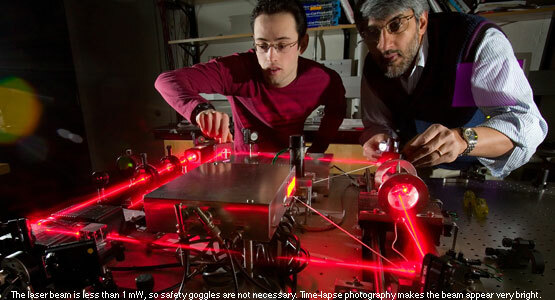 Safety note: The laser beam power is less than one milliwatt, so safety goggles are not necessary. Time-lapse photography makes the beam appear very bright. At Williams physics students work closely with faculty on a variety of research projects. Every summer the department hires several students to work in our experimental laboratories and on theoretical projects. Seniors may elect to do honors thesis projects that typically begin the summer before the senior year and culminate in a written thesis at the end of April. We are particularly proud that Williams physics majors won the LeRoy Apker Award in 1999, 2002, 2004, 2010, 2015. This national award is the highest honor for physics research by an undergraduate student in the United States. Williams students have won more Apker Awards in the United States than students from any other primarily undergraduate college. The following list shows the current research interests of the faculty and their students. For decades, the Williams College physics department has had a tradition of providing summer research experiences for undergraduates. In 1991, Williams College became the first undergraduate institution in the country to be awarded a Research Experiences for Undergraduates (REU) grant in physics from the National Science Foundation. Through a series of such grants, we provided research opportunities for students from a variety of institutions for eight summers. In recent years, with an increase in the number of Williams College students seeking such opportunities at Williams, we have shifted our focus so as to better serve our own students. We now have several research grants which together with College funds allow us to offer research positions to around fifteen Williams students each summer (but no longer to non-Williams students). These students, who work closely with their faculty advisors, are among 150 undergraduates doing research on campus each summer in the natural sciences and mathematics. The physics students work on a variety of projects, both experimental and theoretical, and give occasional talks on their work within the department. At the end of each summer there is a joint poster session in which all the science and math students present their results.